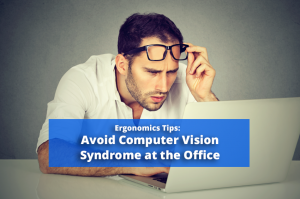 About Computer Vision Syndrome from Ergonomics Specialists, Solutions Northwest, Inc. Whether you work on an office computer or use your smart phone to communicate, screen time is unavoidable for many American workers. In fact, “the average American worker spends 7 hours a day on the computer” (AOA). As you may expect, too much screen time puts you at risk for eyestrain disorders like computer vision syndrome. Computer vision syndrome (CVS) is a term to describe the discomfort or digital eyestrain one may feel after viewing a screen for long periods of time. According to the Mayo Clinic, “CVS is similar to carpal tunnel syndrome and other repetitive motion injuries you might get at work. It happens because your eyes follow the same path over and over.” Symptoms include headaches, eyestrain, blurred vision, dry eyes, fatigue, neck and shoulder pain. Eliminate glare on your computer monitor – To reduce screen glare, dim any overly bright lights in the room. However, be sure to keep the room lit enough for reading or writing notes. Using glare reducing monitor overlays or tilting your monitor can sometimes reduce screen glare. It may be necessary to move the monitor and/or work surface to a different location or close the blinds if glare is coming in from the windows. Avoid competing light sources – Make sure your monitor is not directly in front of a window, directly under a bright light, and there are no lights shining directly into your eyes. Consider glasses – If you are having trouble seeing the monitor, it would be a good idea to consult your eye doctor. If you wear bifocals and use a computer regularly, you may want to ask about computer glasses in addition to your regular glasses. Adjust your workstation properly – Your monitor height should ideally be adjustable, although this is not always necessary. The top of the screen should be at eye level for normal vision and reference materials should be as close to the monitor as possible to reduce excessive head and eye movement. If you wear glasses which require you to use the lower portion of the lenses to read the text on the monitor, try lowering the monitor a few inches below eye height. Remember to remain proactive for a happy and healthy work environment. For some of these tips, you may need to speak to your office administrator or human resources director. Additionally, you may want to consider contacting an ergonomics expert to assess your work environment.